The lawmaker, representing Alimosho Constituency 1 in the Lagos State House of Assembly, Hon. Adebisi Yusuff in an interview, spoke on effect of money politics and its attendant effect on the nation. He also spoke on other sundry issues, and called for a deliberate action to reduce money politics in Nigeria. What lesson would you say we learned from the last general elections? The last election was a tedious project, in fact I am afraid for Nigeria the way we are going. A time will come in this country that if we are not careful, we won’t find intelligent people with integrity or people that know what to do and when to do it venturing into politics, if they don’t have money. I must confess to you, people do not even know what you have contributed towards the development of a system, it is what they can get from you, forgetting that it is what you put down in sustaining the system that matters than what you get from the system. Sustaining the system is most paramount now in Nigeria, if the current trend continues, I am afraid even I pity the propagators of “not too young to run” because no matter how brilliant you may be if you don’t have the means or money you cannot go far. We thank God in that Lagos State we have got a very focused leader in person of Asiwaju Bola Ahmed Tinubu. For me, I will continue to be blunt and speak my mind because that would be my legacy that other people would meet. Those who had been there long time ago, we are reading their piece, witty contributions, seminars and all that. It is what they have the courage of speaking about that inspires the young ones to become something, but if you are afraid that you are going to offend somebody and you refuse to utter it you are dead because the moment you die with it you are dead completely and that is why I feel that we should do something about money politics. Does the high level of poverty in the country have anything to do with this? It is true to a certain extent that it is a result of poverty, but even you that you are doing everything possible to make the system work, when the time comes they forget about what you have done in the past. They forget what you have don so soon, in essence I am advocating the retraining and rebuilding of our mindset to ensure that what is obtainable today is redefined so as to justify our continued existence and integrity. However, how would poverty not come, when the electorate would demand the little money I supposed to invest in projects. The system won’t thrive without money, but we thank God for everything. But were it to be based on performance some people are in this country and with what they have done so far, the electorates ought not to ask them for anything, when it is time for elections. In the United States of America, such a person may continue to be there for years. I just returned from Chicago in the United States of America the Speaker of the House of Assembly there has been in office for fifty years as Speaker not as an ordinary member whereas people are talking about the Speaker of the Lagos State House of Assembly, Rt. Hon. Mudashiru Obasa who is just going for the fifth term and second time as Speaker. But when you look at the way Obasa is handling issues in the House today you will know that we need somebody like him that is full of experience and that can stabilize the House, who knows what to do and when to do it. That is just it, we should be building institutions not individuals. .
You recently brandish your CV to prove a point on social media. What role do you feel adequate sensitization can play in toning down money politics? There is one particular candidate from a different political party. He committed what a journalist or social scientist would call ‘class suicide’ by derailing from the ruling party and decamping to another party to contest with me. He was saying that “imagine Bisi Yusuff who cannot even express himself in English Language.” I regard them as novices, he can be said to be suffering from political schizophrenia. They are living in illusion and more like in a mirage due to their vested interest, which is conflicting with their sense of reasoning, which informed what they eere saying. I graduated from the university before many of them were born. Moreover, I have spent eight years as a lawmaker. I would have gotten several additional degrees within this period of I had enrolled to a school eight years ago and you can’t buy experience with money. In essence I feel I need to thank my constituents for the confidence in me despite the character assassination and the deliberate heating up of the polity. The people stood and they helped me. I scored the highest vote, over 45,000 and again “Mr. Honourable” contested against me with all the degrees and intimidating resume. The people now call him “Honourable 2004” because he scored 2004 votes, you can see the wide margin in the difference. Clearly without that there is no way I would have emerged victorious. Especially, if you look at my health program alone, you will see that we are interested in the welfare of the people. When I now came out with my compendium, people were asking if I was going for governorship election and I said no because it is only governor that can dabble into such a thing and this is just because I am not a sleeping. I am not a docile lawmaker and I do not run away from them. I have a functional constituency office running from time to time even when I am not around. I have a team of media people who are on ground, they are putting heads together, doing researches and some other things because you can’t afford not to be informed so that you are not deformed. They say a reader is a leader. What advice to you have for members of the National Assembly over the leadership tussle for the 9th Assembly so that we don’t have a repeat of what transpired in 2015 and what would be your candid advice to the incoming Governor Babajide Sanwoolu of Lagos State? There is no where in the world that you would do anything outside the party as a politician. So the party hierarchy should know who is going for what, that is what stabilizes the polity of a country. We all know how Senator Bukola Saraki became the Senate President by fraud and we saw the consequence of that. So why should we go through that trend again, we should not because experience will guide us. If you obtain your certificate by fraud definitely you would secure a fraudulent job and the end of it is shameless exit from the system like the defeat of Bukola Saraki in Kwara State. That is where we saw a Senate President losing his polling booth and when he want to go out of his domain people shouted him down. So, I will advise the members of the National Assembly that whatever they want to do,we have a national leader and other high ranking leaders of the party. They should discuss with the leaders of the party and constitute very formidable team that would have the interest of the nation at heart not individual ambitions. The law states that the legislators shall choose somebody among them, the party influence is not really captured in the law and the National Chairman of the APC is however signalling the direction the politicians on appointing their leaders, would you consider that a democracy? That is what the law states, but there is internal democracy. What it means is for you to subject yourself to party discipline and know that the party is supreme. The party supported them to the heights they are. Those that are faulting the decision of the party are really not disciplined members. So anybody supporting Ali Ndume should be considered as an undisciplined member of the party? Oh yes, do you just come to contest for a position without identifying with the party? The terminology that the party is supreme must hold sway, it is applicable anywhere even in the United States of America even in the UK. You know that the party must have an internal mechanism by which they determine who gets what, the leadership of a party anywhere evolve from a gradual progression. You cannot just come from the blues and say you want to be anything or contesting for something. 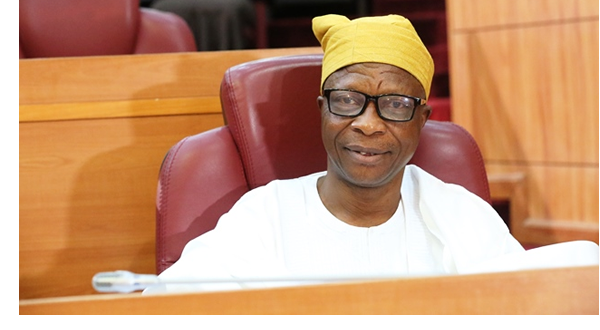 The party supported some of them to become what they are today and as a result,they must do everything in line with what the party is saying, but I know they would fail, those who are not toeing the party line will not succeed..
What should the Lagos State Governor-Elect, Mr. Babajide Sanwoolu look out for in crossing his executive cabinet selection? Sanwoolu should not do it alone, he should consult with leaders widely that is my own candid opinion and I would not shy away from saying that. He should not arrogate the selective power to himself alone. It is when you do that, that people view it as a team work and they would have confidence in you. Gone are those days when Asiwaju Bola Ahmed Tinubu will not even do that to anybody if you know him like I do, the Jagaban of Borgu would never select alone, he would ensure that he consults with every leader in each local government before concluding or coming up with the list and the era of saying somebody is imported from somewhere has gone. I trust him, he has trained thousands of his foot soldiers today in Lagos, in other parts of Nigeria and even outside the shores of Nigeria. He is being reckoned with across Africa as a leader that has a political family, sometimes even across all the party lines.There are politicians in other parties who align with his political ideologies, his aspirations and all that. So this is the kind of man that we need. What are you doing differently this third term? I will build on what I have done and I would continue in a different manner and with more vigor. I would not sleep on the floor of the house and I would be as articulate as ever. I will marshal the points as it should be in the interest of my constituents and Nigeria as a whole. My constituents should be rest assured that they have a ranking member of the House as their representative. Aside legislative business, my constituents are now more confident in me being a third timer. They follow me as a role model, I now have the Prince of Hope School of Thought, where I lecture young people to know what to do. I will never abandon my healthcare program. I am even sure it would outlive me. Then i will focus on education, being a vehicle for development, when you build the mind of the people you have built the schools, roads, several social amenities and infrastructure yet to be seen. I will continue to fund their academic progression, distributing JAMB forms, organise skill acquisition programme like ICT training and more. As a former council chairman and a ranking legislator, I will bring my wealth of experience to bear and lobby the executive to curry more favour in my constituency. Our Speaker have chatted a course for us today to forge ahead. This 9th Assembly will be a different one due to the fact that so many experienced lawmakers are returning, so expect a robust legislative session. How do you view the reduction in the number of women especially in the coming 9th assembly? Given women soft landing in political space means you are reducing their status. In the university the score that gives you admission is not gender sensitive, consider Hon. Adefunmilayo Tejuosho, whose stance is more than that of a man, they should join the struggle. If they keep lamenting, men would continue to dominate them in the political space.